I just received this email from American Express. 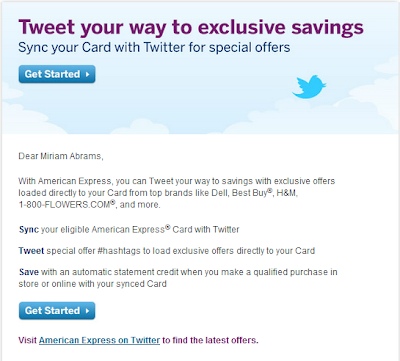 Now you can save money by tweeting American Express Special Offers on Twitter. Read below for details on how to take advantage of this offer. 1 - Sync your American Express Card with your Twitter Account, click here to register. 2 - Tweet the special offer you are interested in, with your linked Twitter Account. 3 - Save when using your linked Amex card with an automatic statement credit from the merchant you have signed up with, when meeting the terms of the offer. Excludes McDonalds that are in Walmart. One time, first purchase only. Not valid on shipping services, 1 per cardmember. Some Terms: 1 per cardmember, usually takes 2-3 days for credit (can take longer). Registration limited on lots of these offers.